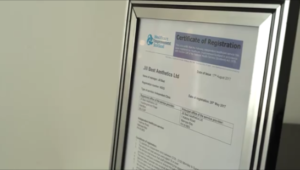 In May 2017 Jill Best Aesthetics Ltd was registered with Health Improvement Scotland (HIS) to operate as an independent clinic. Jill Best Aesthetics is regulated by Health Improvement Scotland:Jill Best Aesthetics Ltd, is registered in Companies House, Edinburgh as a limited company; Company Number 506040. Independent clinics are defined in the National Health Service (Scotland) Act 1978 as clinics that are not part of a hospital and from which a medical practitioner or dental practitioner provides a service, which is not part of the National Health Service. The term ‘service’ includes consultations, investigations and treatments. If you are the provider of an independent clinic (as defined above), it is a legal requirement to register your service with HIS. As Jill Best is a provider of an independent clinic and a registered nurse, Jill Best Aesthetics is now regulated and audited by HIS. Any clinic not registered may face a fine of up to £5000 a three month jail sentence and investigated by their governing body, such as NMC GMC or GDC.